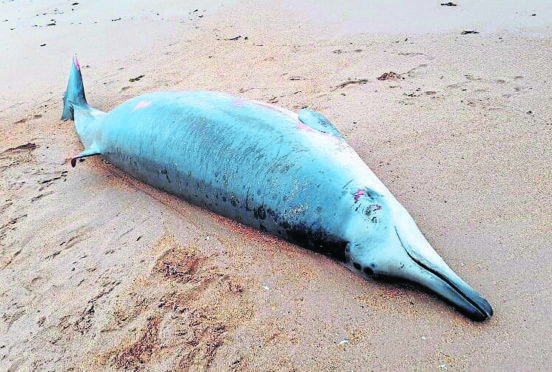 The Scottish Marine Animal Strandings Scheme said the Sowerby’s beaked whale stranded alive on Belhaven beach near Dunbar last month and died shortly after it was found. With assistance from the East Lothian Council and the National Museum of Scotland, the carcass was recovered and transported to Inverness, where a post mortem examination was carried out. The 12 feet, four inch-long juvenile male – weighing just over 1,322lbs (600kg) – was in a good body condition and there was no evidence of recent feeding. The SMASS said: “The most striking finding was the bilateral trauma to the ribs with eight ribs fractured on both sides, with associated haemorrhages. Meanwhile, the SMASS report for the month also said that a young harp seal was found dead on an Aberdeenshire beach just months after one was found in Skye. Harp seals are an Arctic animal and a rare visitor to Scottish waters. The seal was found at Balmedie, near Aberdeen. From the Skye seal, a small piece of plastic was recovered during a necropsy carried out at SMASS’s Inverness lab. The 6cm (2in) square fragment had been stuck for some time in a part of the animal’s stomach which empties into the intestines. Scientists at SMASS said the plastic may have played a part in the seal’s death. The report said: “Scotland is outside the normal range for this ice-associated species, although vagrant animals such as this have been recorded in the UK and even further south in Europe in the past on rare occasions. There were a total of 59 stranding reports of cetaceans and seals in July.